But the report is still quite complex so this post we explain the different sections in a bit more detail. This summarizes how many songs have been loaded and checked, how long it took and how many and what percentage have been matched to MusicBrainz, Discogs and if we could find artwork for them. One thing to consider when matching is whether to rematch songs that have already been matched or whether to ignore songs that are already matched. By default SongKong rematches all your songs but if you disable Basic:Match all songs, even if already matched then all songs that already have a Musicbrainz Id are ignored and not considered in the following sections. 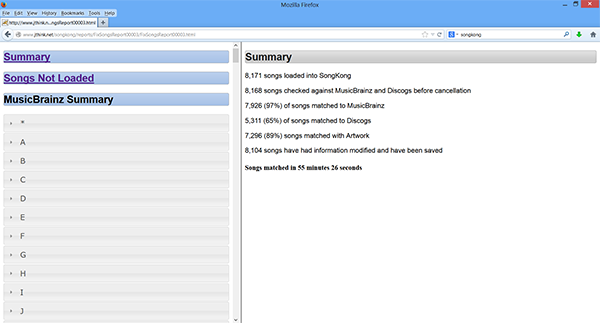 MusicBrainz is the primary data source used by SongKong. 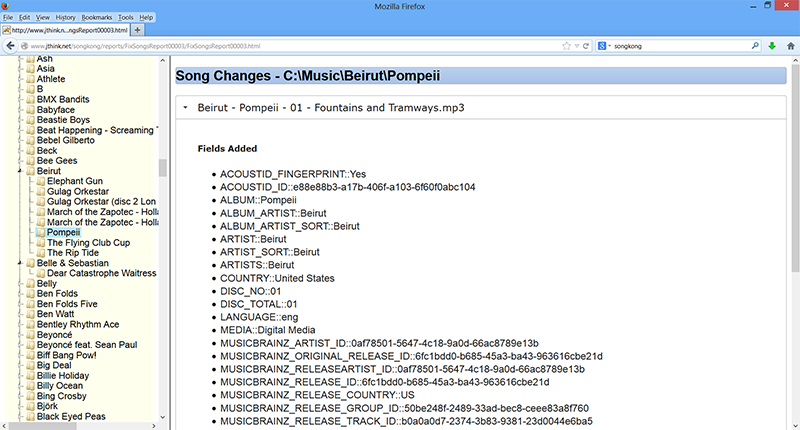 This section shows what MusicBrainz releases your songs have been matched to. In the left handside we group the matches by the first letter of the album artist, if the first letter is not a letter they are put into the * grouping. Expanding on one of the letter groupings, lists the artists starting with that letter in alphabetical order. 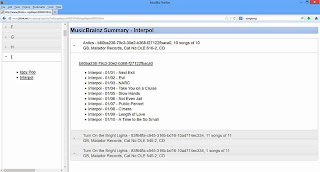 Selecting an artist from the list shows how your songs have been matched to their releases on the right hand side of the report. By default only details of the first matching releases are shown, you can open close details by clicking on the small arrow in the release header information. The header tells you the name of the release together with its MusicBrainz Id, Record Label and Catalog No if known. It all shows you how many of the total songs on the release have found corresponding matches in your collection. 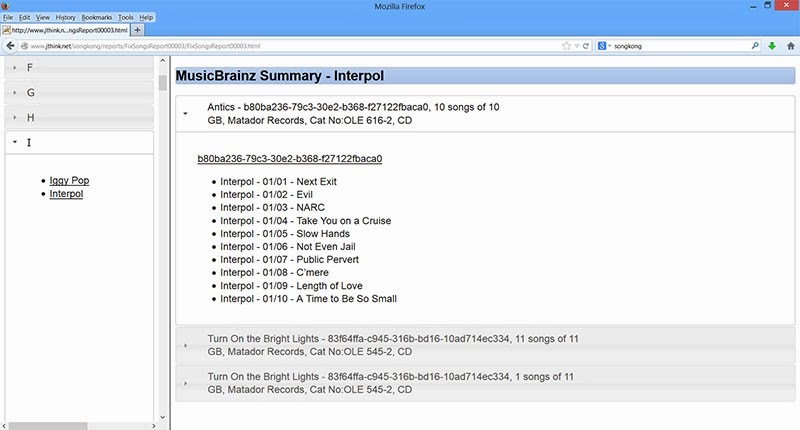 The details provide a hyperlink to open the MusicBrainz page for the release. Below this we list all the songs that were matched together with the song artist, Disc No and Track No. If you have multiple copies of a song then the same release may be listed more than once, we always match the most complete match first. Note this section looks at the details of your songs and their mapping to MusicBrainz, if the were already matched to MusicBrainz but not matched during this run of Fix Songs they will still show in this section. This works in the same way as MusicBrainz. Songs can be matched to Discogs either by a direct search to Discogs or by a relationship existing from a MusicBrainz Release to a Discogs release. But Discogs is a secondary data source and Discogs matching and searching can be disabled, if both options are disabled in the Match tab then this section will not be shown. This section shows what changes have been made to your files and is a listed as a file hierarchy. Each leaf folder can be selected and then the changes for each file in the folder are shown on the right handside of the report. It is important to realize there is not a tight correspondence between songs matched in MusicBrainz/Discogs and Song Changes for the following reasons. 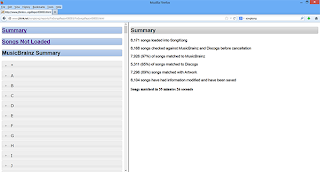 If the song was already matched to MusicBrainz and then rematched again to the same release they may not be any change required because the song already contains the fields matched. If the fiename mask has changed then the file will probably need to be renamed even if no metadata added to the files themselves. 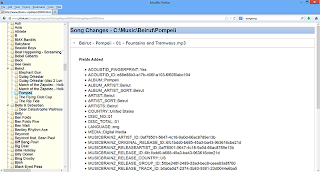 If Fix Songs is canceled before its has completed songs may have been matched to MusicBrainz but interrupted before the changes could actually be written to file. Selecting this list all the songs that are not matched to either MusicBrainz or Discogs in the right hand side using a file hierarchy view. Selecting this list all the songs that are not matched to MusicBrainz in the right hand side using a file hierarchy view. Selecting this list all the songs that are not matched to Discogs in the right hand side using a file hierarchy view.